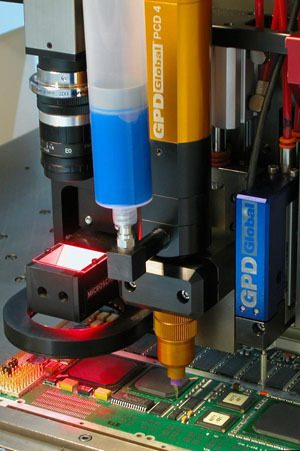 The Capillary Underfill process consists of dispensing a void-free fluid to encapsulate the bottom side of a silicon die or BGA device. Encapsulation covers the top surface, typically where fragile interconnects are located, but in the case of Capillary Underfill, the fragile interconnects are located on the underside of the component. Underfilling enhances the connection strength of electrical contacts and compensates for differences in thermal expansion rates of the two joining materials that could lead to product failure. Underfill is typically used for applications in high shock environments or when consistent reliability is required. The Underfill process requires substrates to be at an elevated temperature for proper processing. These elevated temperatures reduce fluid viscosity. Good dispensing is done with pumps with a positive shutoff mechanism for controlled dispensing. Our NCM5000 Jetting Pump and our innovative Progress Cavity Displacement (PCD) are two of these pumps. A jetting pump has the advantage of dispensing small droplets from up to 4 mm above the surface while maintaining a small wet out area. This benefits small devices and devices with passives in close proximity. The PCD is a continuously volumetric pump that does not vary in volume even when viscosity and temperature change. It dispenses Underfill for larger devices quickly and with excellent precision and without the need for continued calibration. Pre-Heating from ambient temperature to 80 degrees C.
Vision alignment of the device. Locate surface to dispense (z axis). Dispense the fill pass - multiple passes may be required. Dispense the fillet pass - may not be required depending on device size or underfill material selection. Inline systems are recommended for Underfill due to their ability to use pre- and post-heaters. 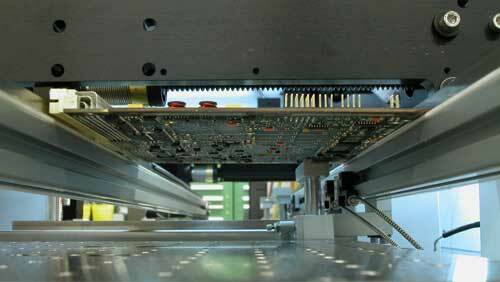 Pre-heating is used to quickly heat a product from ambient temperature to process temperature. Different methods of pre-heating are available. 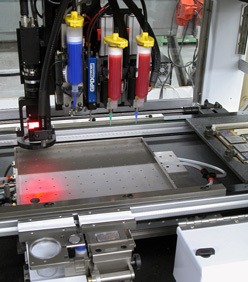 The most common method is a custom contact vacuum fixture. This fixture offers the quickest and most uniform heat transfer. A universal heating method utilizes forced air. Forced air allows any substrate to be heated no matter the geometry or size, but time to heat is longer vs contact heating. The pre-heat area has an optional sensor to monitor product temperature. If the substrate reaches the operating temperature, heat is removed and the substrate is transported to the work area. The work area also has an optional TempView Imaging System to monitor all areas to be underfilled; the system starts the dispense process when all areas reach operating temperature. Post-heating is used after the dispense process to continue the flowing process. 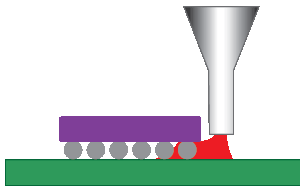 Depending on the application, the post-heater may be used to continue flow for larger devices before going to final cure. The system scans all die to determine unit orientation and which units to process. Accurate alignment of each die is necessary to keep the dispensed material within the allowed wetted areas. The alignment process can be very tricky when silicon dies are used because the surface texture and finish can vary from unit to unit or lot to lot. It is these variations that can make finding a die using a standard illumination system very difficult. 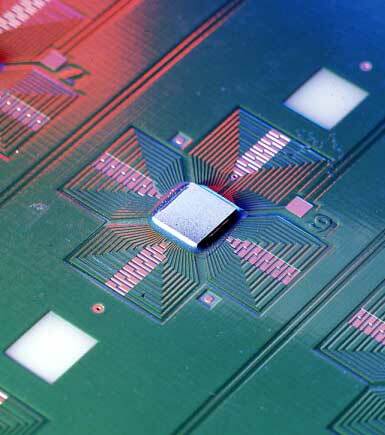 By using FullView Illumination, which is a combination of a low angle dark field with an on-axis source, any die can be found. 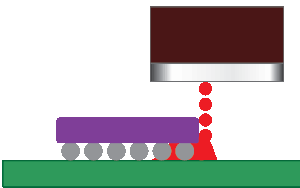 The majority of the material that will flow under the die is deposited during the fill pass. The pattern for dispensing the material is also key for a successful process. In most cases, the "L" pattern is the best choice. The "L" starts on the longest side of the die and turns the corner to the shorter side. A fillet pass is required. In many cases, the fillet pass is required. The fillet pass is used to "finish" the process by applying enough material to create the sealing joint. In an optimized process, all fill passes are dispensed first, and then after the material flows, a fillet pass is dispensed. Dispensing all the fills first gives the material enough time to flow under the die. Note that a multiple fill pass process takes longer but the cosmetics of the finished product are excellent. In some very high volume applications, a large quantity of material is dispensed in a single pass with no fillet. The cosmetics of this process show a large wetted area to one side of the die but the functional results are acceptable. Additional process control is achieved through volumetric feedback that comes from an integrated weight scale. During the calibration process, the weight scale monitors the amount of material dispensed over a period of time. If the amount of material varies from expectations, the system adjusts the dispense parameters to ensure consistent dispense quantity. This calibration routine compensates for material changes over time (pot life) and batch-to-batch variations. Choosing an appropriate Precision Dispensing System and pump for underfill process is vital. We recommend the MAX II or DS Series for heated underfill applications. The systems are equipped with 1, 2, or 3 heated zones for the substrate depending on machine configuration and application. Heating the substrate, up to 100 degrees C, is done via custom contact vacuum fixturing or via non-contact forced air. Other available system features are Substrate Temperature Monitoring in the Pre-Heat, Closed-Loop Process Calibration, and Full View Illumination. The recommended pumps for underfill applications are the Volumetric PCD Pump Series and NCM5000 Jetting Pump. Progressive Cavity Displacement (PCD) dispense technology excels at dispensing underfill on components 10 mm and larger because of its ability to dispense fluids at a controlled, high flow rate. Coupled with GPD Global's standard S Type taper tip nozzles, controlled flow rates are unmatched. For devices smaller than 10 mm or have very tight keep-out areas, we recommend NCM5000 Jetting Pump. NCM5000 Jetting pump is fast for small droplets, it minimizes wet out area and optimizes dispense rate for small volume.